Of course the concept of data-driven business accompanies all the excitement around data, big data, and new innovations to drive insights. Who wouldn’t want to be data-driven – right? But I believe that many companies may suffer from a very nuanced, but very important difference between being data-driven and using data to prove assumptions and support an already biased conclusion. To be more specific; are you using data to inform which decisions to make or have you already made a decision and simply looking for data to prove your assumptions? The latter is, unfortunately far more common. It is natural for us to want to find data that supports our conclusions, but does it create a situation where we become overly biased and unable to interpret the data properly because we are fixated on wanting to prove a point. The other issue is that data, by its very nature, is interpretive and can be used to support often conflicting positions. For example you often see percentage of adoption statistics used in analysts or vendor reports to prove momentum or the lack thereof; what exactly does 38% of those surveyed are planning to investigate using cloud-computing technologies? Or 47% of enterprise laptops run out of date anti-virus engines – is this good, or bad…you could easily make a case for both sides using the same data set and that, coupled with our humanness, is ultimately the challenge with data analysis positively impacting the business. 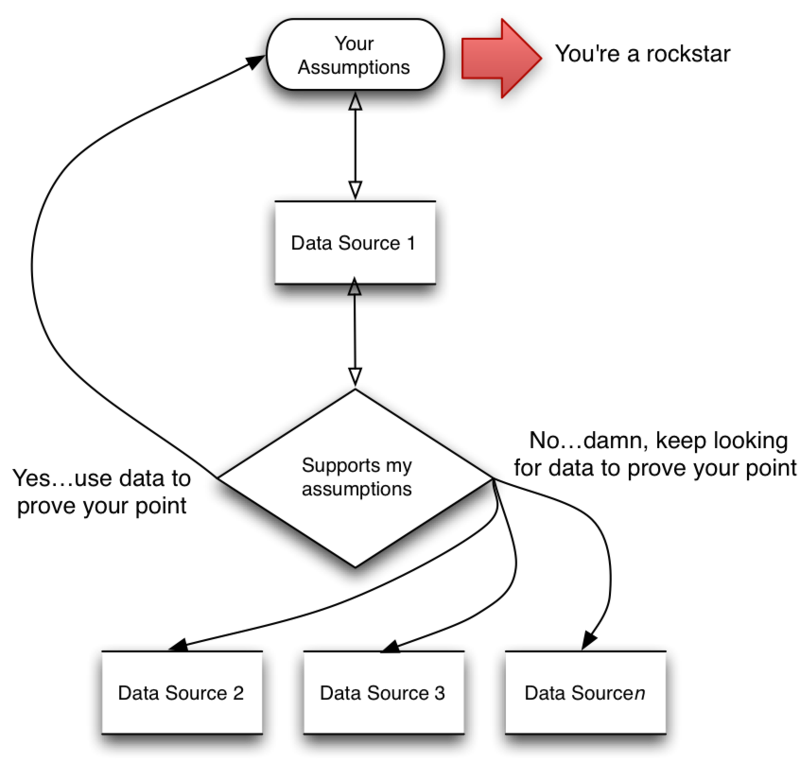 The bottom line is to ensure that interpreting results leads to information, knowledge and wisdom vs. simply using data to prove a point against a biased assumption. This entry was posted in Analytics, BigData and tagged Analytics, business intelligence, data-driven. Bookmark the permalink. This is spot on. This effect (there is probably a name to it) is common and reaches beyond information security. It is easy to be trapped in this tautology ourselves.The only way I have seen this to consistently address this issue is by using heterogeneous team interpret the data.